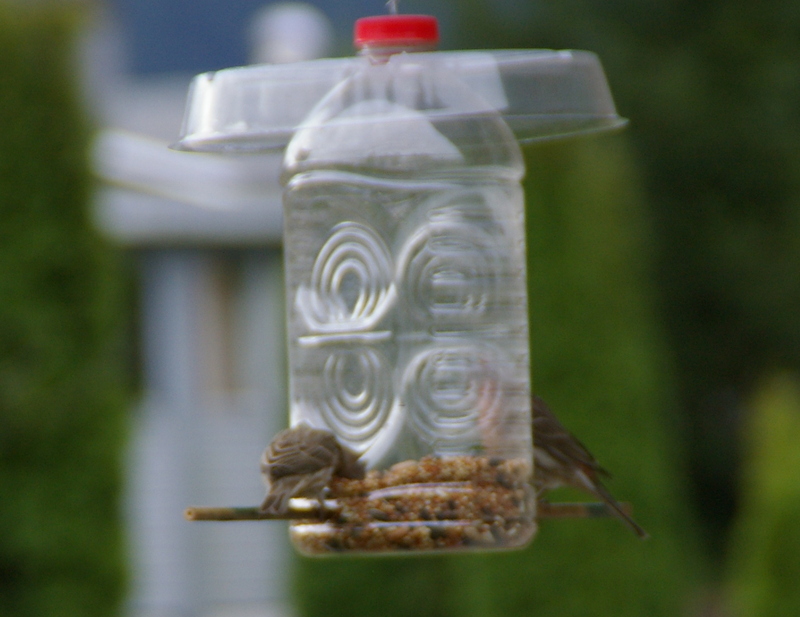 i built my first bird feeder at the end of february…for free! today, march 2, the first birds arrived to feast. the feeder hangs only a metre away from the kitchen window about 3 metres above the ground. using a 2 litre juice bottle (costco cranberry) i cut two slight ovals at the lower end of the bottle, one on each side. using a 30cm bamboo stakes i drilled a 6mm hole and ran the bamboo through to create a perch for each feeding slot. to hang the feeder i drilled another 6mm hole in the lid sliding the hook from an old hanging basket through then slid a plastic plant saucer as a rain cover. i strung the complete feeder with thin wire from the eave. next a bird house or two!